Every summer smoke from California wildfires causes hazy conditions in Reno. The smoke reduces visibility and has a serious impact on Northern Nevada’s air quality. This is a common problem during the summer months when wildfires are most prevalent. The smoke rolled in this weekend and it put a damper on the Reno Balloon Races special event on Sunday. This reminded me of the 2013 Best in the West Nugget Rib Cook-Off when the whole valley was covered in smoke and there was little visibility because of the poor air quality. We were afraid it would wreck our event, but we made it through and learned these valuable lessons. Looking back at the 2013 event I wish I had watched the weather patterns closer and paid more attention to the news about the wildfires. We took a lets pray and see how it goes attitude. In hindsight I wish we would have paid more attention leading up to the event and been more proactive, especially with our communication with the public about event contingency plans and how we planned on continuing even if the smoke hurt air quality in Reno. The news didn’t do us any favors, that is for sure! During the event local news kept telling viewers to stay inside and avoid smoke. They didn’t have one expert on to scientifically discuss how the smoke would affect viewers, they just said stay inside, don’t go outside. Period. Then it got worse. The news in Sacramento and the San Francisco Bay area started announcing the Rib Cook-Off was canceled due to the smoke and the fires. This was not true. We had hotel guests calling upset we canceled the event and received several nasty emails. As soon as we calmed the guests down we started reaching out to the media to let them know the event wasn’t canceled and that we wouldn’t cancel the event no matter what happened with the smoke and the weather. It was very challenging to get them to run corrections and share the correct information. In hindsight we should have been more proactive and sent out several press releases right away and increased our social media activity to let everyone know the event was going on as planned. The first day of Rib Cook-Off 2013 our beverage sales were up 12%. I’m not sure if it was because the smoke made people want to drink more, or if attendance was up in general that day but we used this information to make lemonade out of lemons. We knew we needed some positive press to encourage people to attend the event in the smoky conditions. We looked at the event financial results after the first night (as we always do) and we realized they were great! We sent a press release announcing our record sales and that was newsworthy. Right away our local media gave the event positive coverage and shared the economic impact the event has on the community. Our community takes pride in special events and their great economic indicators. We make lemonade out of lemons, and so does the whole community. One of the biggest lessons I learned from this was don’t give up. When the media is out there with bad information you need to keep fighting to get the accurate information out there. Half of the event attendees come from California, that is a few hundred thousand visits to the event. We needed to fight to get the information out there that no matter what happened with the smoke from the wildfires the Best in the West Nugget Rib Cook-Off would still be there for our attendees. Our team did a great job fighting to get accurate information to California media outlets. Our fearless PR Manager, Lauren Garber, wouldn’t give up until she got through, she kept fighting because it was the right thing to do. When you plan special events things will happen that are outside your control. Mother Nature loves to torment event planners. It is important to adapt to whatever is thrown at you when you are an event planning professional. It isn’t always pleasant, but you need to look at the threats that might hurt your event and find ways to adapt and work around the threats. A good event planner can adjust so quickly and gracefully that most guests won’t even realize there was a problem. I learned many valuable lessons during the 2013 Best in the West Nugget Rib Cook-Off. Even though at the time it was extremely challenging, I’m grateful for the lessons I learned and hopefully this will help other event planners think about these types of challenges and adapt quickly. Wildfire smoke and other natural events are out of your control, but you can control the way you respond and adapt. Communication – It Isn’t About You! I recently learned a valuable lesson from Chris Howard, the Value Creation professor for the University of Nevada MBA program. He taught me a new way of looking at communication styles. The biggest lesson that he really drove home was that communication isn’t about your style of communication; it is about the other person’s style of communication. Let me repeat that in a very direct way…Communication-it isn’t about you! It should be about the person you are trying to communicate with, not your style of communication. There is no style better than another, they are just different. Since learning about these communication styles I have changed some of my communication techniques. I took a test to determine my style. At the end of this post are links to two different quizzes to help you determine your style. There are dozens of quizzes online to help you determine your style. 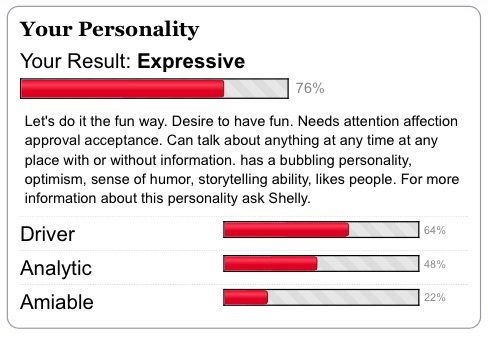 The two highest scores I received were 76% expressive and 64% driver. I wasn’t surprised by the results because as the instructor explained the characteristics in class I knew I was either an expressive or a driver. I’m using this information as I plan special events and when I develop marketing plans. Now I’m analyzing my business contacts, my coworkers, and my customers based on their communication styles. My boss is a driver so I’m trying to be more direct with him, less small-talk, and always be on time or a few minutes early. I think it has helped us communicate better. One of my coworkers is amiable so I make sure to be extra warm and friendly to them, and realize that they appreciate small talk and genuinely getting to know their coworkers. Once I started adapting to their communication styles, I started developing better working relationships. Knowing my communication style has also helped me see where there is a weakness in my communication methods. If I’m dealing with an analytical person I need to tone down my expressive side. I need to do whatever I can to speak in the analytical person’s preferred communication style to be successful. It makes everything so much easier when you think about communication based on the other persons preferred style. It isn’t hard to adapt to this mindset, it just takes practice. The first step should be determining your communication style. Then learn the characteristics for all four styles. Once you know the basics you will start to see signs on how to communicate more effectively. You can see signs everywhere! I’ve noticed them in emails, body language, choice of clothing, office decorations, listening skills, in the way people handle change, and risk management. There have been studies that show some people with certain styles tend to drive a certain type of vehicle or buy a certain color of car. I’m not that much of an expert so I won’t go that far, but if you do a quick Google search you can find several lists of these characteristics. So what is your communication style? Take one of these free non-scientific quizzes online and find out!